This article is about the group of Canadian regional sports networks. For other uses, see Sportsnet (disambiguation). Sportsnet's logo used since October 3, 2011. Sportsnet is a Canadian English-language sports specialty service. It was established in 1998 as CTV Sportsnet, a joint venture between CTV, Liberty Media, and Rogers Media. CTV parent Bell Globemedia then was required to divest its stake in the network following its 2001 acquisition of competing network TSN. Rogers then became the sole owner of Sportsnet in 2004 after it bought the remaining minority stake that was held by Fox. The Sportsnet license comprises four 24-hour programming services; Sportsnet was originally licensed by the Canadian Radio-television and Telecommunications Commission (CRTC) as a category A service, operating as a group of regional sports networks offering programming tailored to each feed's region (in contrast to TSN, which was licensed at the time to operate as a national sports service, and could only offer limited regional opt-outs). Since 2011, the service has operated under deregulated category C licensing, which allows Sportsnet to operate multiple feeds with no restrictions on alternate programming. In each region, only the local Sportsnet channel is available on analogue cable, but all four channels are available nationally via digital cable (subject to blackouts for some out-of-market teams). The four Sportsnet feeds air some common programming and simulcast major, national events, but are capable of airing programming autonomously—most prominently regional programming. Sportsnet is the national cable rightsholder of the National Hockey League, and also holds regional rights to five of the league's Canadian franchises. It is also the national rightsholder of Major League Baseball in Canada (although most of ESPN's MLB broadcasts are sub-licensed to rival network TSN), and the exclusive broadcaster of the co-owned Toronto Blue Jays. It also splits regional coverage of the Toronto Maple Leafs and Toronto Raptors with TSN; Rogers Communications and TSN's parent company Bell Canada own a joint majority stake in the teams' parent company. The Sportsnet brand has since been extended beyond the original regional channels, now encompassing the national channels Sportsnet 360, Sportsnet One (and its regional part-time companion channels), and Sportsnet World; Sportsnet Radio stations in Toronto, Vancouver and Calgary; and Sportsnet Magazine. With these brand extensions, Rogers now generally uses "Sportsnet" (by itself) to denote its sports media properties as a whole, and on-air promotions for programs being carried nationally by these four regional feeds often list all four channels separately, or refer to the Sportsnet "regional" (or "main") channels, to avoid any ambiguity. However, standalone mentions of "Sportsnet" in reference to a specific channel can still generally be assumed to be referring to the four regional channels (or the specific regional channel available locally on analogue cable). According to Rogers, Sportsnet is available in 8.2 million Canadian homes. Sportsnet was approved by the CRTC in September 1996 under the tentative name S3, with Baton Broadcasting Inc. (later renamed to CTV Inc.) holding a 40% controlling interest in the network, and 20% minority stakes held by Rogers Media and Liberty Media. The network proposed a structure with an emphasis on regional programming, operating four feeds to serve different areas of the country. The network launched on October 9, 1998 as CTV Sportsnet, under the ownership of CTV, Rogers, and Liberty; the latter which owned some of the Fox Sports Net operations that Fox ran in the United States after which the channel was named. The new network gained credibility before it went on the air, having acquired national cable rights to the National Hockey League from long-time holder TSN. From 1998–99 until 2001–02, Sportsnet aired NHL games to a national audience throughout the regular season, and covered first-round playoff series not involving Canadian teams. Its first live sports event was an NHL opening night telecast between the Philadelphia Flyers and New York Rangers. The national cable rights to the NHL returned to TSN in 2002, though Sportsnet retained regional broadcast rights for most Canadian NHL teams. When CTV purchased NetStar, the former parent company of TSN, in 2000, the CRTC ordered CTV to sell either TSN or its stake in Sportsnet. CTV ultimately chose to retain TSN, and sell its stake in Sportsnet. The other shareholders had first right of refusal; as Rogers was the only interested party, it acquired CTV's stake in the summer of 2001, and soon after renamed it Rogers Sportsnet. 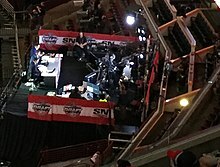 During part of the transition period, during which time the channel was known as "Sportsnet", CTV was allowed to control programming on both networks, and some cross-affiliation and programs that were going to be tape-delayed on TSN, most notably figure skating, were given to Sportsnet. In 2004, Rogers then bought the remaining 20 percent stake from Fox. While Sportsnet had been based there from the beginning, TSN's operations would move to CTV's suburban Toronto complex, 9 Channel Nine Court, following the acquisition. This led to some peculiarities related to the fact that the two rival sports channels were only separated by a "parking lot", leading to jokes and references from both networks. On April 30, 2008, Rogers Sportsnet moved its broadcast operations from 9 Channel Nine Court to the Rogers Building, a cluster of buildings in the Mount Pleasant-Jarvis Street area of Downtown Toronto. In 2010, Rogers began to extend the Sportsnet brand beyond the original regional networks with the August 14 launch of Rogers Sportsnet One – a national companion channel promising 800 hours of live events per year. The channel was also accompanied by additional part-time feeds to serve as overflow channels for its regional NHL coverage. In January 2011, Rogers' sports radio stations, CJCL Toronto ("The Fan 590") and CFAC Calgary ("The Fan 960"), were rebranded as "Sportsnet Radio Fan 590" and "Sportsnet Radio Fan 960" respectively. Critics speculated that the Sportsnet Radio branding was intended to increase synergy with its television counterparts, upon rumors that TSN would be launching a sports radio network of its own. In July 2011, Rogers announced that it would be rebranding its premium international sports channel Setanta Sports Canada as "Sportsnet World" on October 3, 2011 – a move that would allow the channel better opportunities for cross-promotion with other Sportsnet services. As part of the transition, Setanta Sports sold its minority ownership interest in the channel to MLM Management. On September 29, 2011, Rogers published the first issue of Sportsnet Magazine, a bi-weekly sports magazine positioned "for Canadian sports fans", covering professional sports from a Canadian perspective. Sports writer Stephen Brunt left his position at The Globe and Mail newspaper to become the magazine's back page columnist. On October 3, 2011, Rogers Sportsnet underwent a major rebranding, introducing a revamped logo and visual appearance designed in conjunction with Troika Design Group, and a new image campaign ("Fuelled By Fans"). Additionally, the network's official name was shortened to just Sportsnet. The new logo does not incorporate the previous "player" emblem that had been used in the network's branding since its original launch, as research performed by Rogers indicated that its association with Sportsnet did not resonate well with viewers. The redesign of Sportsnet was overseen by Dean Bender, who served as the network's creative director upon its original launch as CTV Sportsnet. On August 25, 2012, Rogers announced that it would acquire the television assets of Score Media, owners of The Score Television Network (a competing sports network which primarily airs sports news and highlights, alongside event coverage), in a transaction valued at $167 million. The acquisition itself closed on October 19, 2012, at which point Score Media's digital assets (including its website and mobile apps) were spun off into another company, theScore Inc., in which Rogers Media would retain a 10% interest. Score Media's TV properties were immediately placed into a blind trust, under trustee Peter Viner, pending final CRTC approval. Rogers plans to continue running the network as a sports news service. The acquisition and Rogers' proposed amendments (which included a reduction in the frequency of sports updates during live events) were approved by the CRTC on April 30, 2013; the same day, The Score also began to air more Sportsnet-produced programming, including a simulcast of CJCL's afternoon show Tim & Sid and Hockey Central Playoff Extra. However, the CRTC rejected the use of a proposed winter sports competition, the Sportsnet Winter Games, for its tangible benefits requirements. On June 4, 2013, Rogers announced that The Score would be rebranded as a Sportsnet channel; the channel changed its name to Sportsnet 360 on July 1, 2013. On October 2, 2018, Scott Moore, Rogers' head of Sportsnet and NHL properties, stepped down. Similarly to regional sports networks in the United States, Sportsnet is operated in four regional feeds. While the feeds carry national programming as well, they primarily broadcast sporting events tailored to the region they serve. The four regional feeds are listed in the table below. All four feeds are available in both standard and high definition formats. Although cable providers in Canada are permitted to carry only the local Sportsnet feed on analogue cable packages, all four feeds can be carried on digital television services. However, in some instances, programming on the out-of-market Sportsnet feeds, particularly regional NHL games, are blacked out due to league restrictions on teams' regional broadcast rights. Since the revival of the Winnipeg Jets in 2011, regional Flames and Oilers games on Sportsnet West have also been blacked out in Manitoba, despite it being the "local" Sportsnet feed for that province. Sportsnet Pacific Regional feed for British Columbia and the Yukon; airs regional Vancouver Canucks games. Sportsnet West Regional feed for the Prairies, the Northwest Territories and Nunavut; airs regional Calgary Flames and Edmonton Oilers games except in Manitoba. Sportsnet Ontario Regional feed for most of Ontario; airs regional Toronto Maple Leafs games. Sportsnet East Regional feed for Eastern Ontario, Quebec and Atlantic Canada. Sportsnet is the main television outlet for Major League Baseball in Canada: it is the exclusive television outlet for the Toronto Blue Jays (which are also owned by Rogers), airing all of its games and other Blue Jays-related programming throughout the season. It also holds Canadian rights to Fox Saturday Baseball, the All-Star Game and the postseason (through Fox, TBS and MLB International). Sportsnet also carries other MLB games simulcast from U.S. regional sports networks. Sportsnet began airing National Football League games Starting with the 2005 season, splitting late games across the Pacific and West feeds, and the East and Ontario feeds. The games not shown in the opposite regions were carried regionally by City. It also had rights to Thursday Night Football and the American Thanksgiving games. Sportsnet lost all NFL broadcasting rights for the 2017 season. Sportsnet carries a large amount of soccer programming; it has been the Canadian broadcaster of the English Premier League since 1998, and also held rights to the UEFA Champions League and Europa League. Sportsnet lost UEFA coverage to TSN for 2015, but gained rights to Bundesliga matches beginning in the 2015-16 season. Sportsnet aired the Amway Canadian Championship, an annual competition featuring Canada's five professional soccer teams – Toronto FC, Montreal Impact, Vancouver Whitecaps FC, FC Edmonton, and Ottawa Fury FC, until TSN acquired full rights in 2017. In 2006, Sportsnet aired coverage of the FIFA World Cup as part of a consortium with TSN and CTV. From 2011 through 2014, beginning with the 2011 FIFA Women's World Cup, CBC sub-licensed cable rights to FIFA tournaments to Sportsnet, including the 2014 FIFA World Cup. Since the acquisition of the City stations (known as Citytv at the time of the acquisition) by Rogers, Sportsnet began providing sports updates for those channels in some cases, although certain stations retain their own sports departments. In the event of programming conflicts, Sportsnet has occasionally moved Calgary Flames, Edmonton Oilers or Vancouver Canucks games to the local City station, although the network's current preference is to use Sportsnet One's companion channels for this purpose instead. On February 8, 2011, Sportsnet announced that it had signed a multi-year deal with Tennis Canada to acquire early round rights to the Rogers Cup. Sportsnet also acquired rights to the ATP World Tour Masters 1000 and ATP World Tour 500 series events. As per an extension of Rogers' sponsorship rights to the tournament, Sportsnet holds sole rights to the Rogers Cup beginning in 2016. In 2016, Sportsnet lost the ATP tours to TSN, but it still maintains exclusive rights to the Rogers Cup, as well as the Davis Cup and Fed Cup. In August 2012, Rogers acquired ownership of the Grand Slam of Curling series from Insight Sports via Sportsnet, adding coverage of its events to the network. CBC Sports continues to provide sub-licensed coverage of weekend draws in selected Grand Slam events. In February 2013, Sportsnet announced that it would become the official Canadian broadcaster of the IndyCar Series beginning in the 2013 season in a five-year deal with the series. The new contract includes broadcasts on Sportsnet's networks and City, and French rights sub-licensed to TVA Sports. That season, Sportsnet also originated coverage from the Honda Grand Prix of St. Petersburg, Indianapolis 500 and Honda Indy Toronto, with Bill Adam, Todd Lewis and Rob Faulds. Canadian driver Paul Tracy joined Sportsnet as an analyst. As of the 2019 season, all but the Honda Indy Toronto and Indianapolis 500 moved exclusively to Sportsnet World and Sportsnet Now+. In May 2013, Sportsnet reached a six-year deal for rights to the national championships of U Sports (then known as Canadian Interuniversity Sport), including coverage of the Vanier Cup. Sportsnet is a major broadcaster of National Hockey League games; the network is the current national cable rightsholder to the league, and regularly airs nationally televised games on Wednesday, Saturday nights as part of Hockey Night in Canada, and Sunday nights as part of Rogers Hometown Hockey. Sportsnet is also a major regional broadcaster of the NHL; its four regional feeds carry regional telecasts of five of the seven Canadian franchises, including the Toronto Maple Leafs on Sportsnet Ontario (split with TSN4 beginning in 2014-15; Rogers and Bell Canada own a joint, majority stake in the team's parent company Maple Leaf Sports & Entertainment), the Calgary Flames and Edmonton Oilers on Sportsnet West, and the Vancouver Canucks on Sportsnet Pacific. In January 2014, Sportsnet lost the Ottawa Senators to TSN, who acquired regional rights to the team in English and French under a 12-year deal, beginning in the 2014-15 season. In September 2014, Sportsnet announced its acquisition of regional English-language television rights to the Montreal Canadiens under a 3-year deal, replacing the Senators on Sportsnet East and succeeding TSN as regional rightsholder, until 2016-17. Sportsnet holds the rights to the Canadian Hockey League under a 12-year deal renewed in the 2014-15 season. Its coverage includes a package of national broadcasts from the CHL's member leagues, coverage of the CHL Canada/Russia Series and the CHL/NHL Top Prospects Game, along with coverage of the season-ending Memorial Cup tournament. From its launch through 2002, Sportsnet was the national cable broadcaster of the NHL in Canada, displacing the rival TSN; it aired a package of Tuesday night games, along with coverage of non-Canadian matchups from the first round of the Stanley Cup Playoffs. On November 26, 2013, Rogers Communications announced that it had reached a 12-year deal to become the exclusive national rightsholder for the National Hockey League, again displacing TSN, along with CBC, a deal which began in the 2014-15 season. Valued at $5.2 billion and covering both television and digital media rights to the league, the value of the contract surpassed the league's most recent U.S. rights deal with NBC. Alongside its existing regional rights, Sportsnet now airs Scotiabank Wednesday Night Hockey, along with games during Hockey Night in Canada. In early 2005, Rogers Media and CTVglobemedia jointly acquired broadcast rights to the Vancouver 2010 Winter Olympics, as well as the London 2012 Summer Olympics. This was considered a serious coup, as the Canadian Broadcasting Corporation (CBC) had consistently won Olympic broadcast rights from the 1996 Summer Olympics through to the 2008 Summer Olympics. CTV and V were the primary broadcasters; Sportsnet, TSN and RDS provided supplementary coverage. Rogers announced in 2011 that it would not bid with CTVglobemedia's predecessor Bell Media for the rights to the 2014 and 2016 games, citing scheduling and financial issues. While Bell Media did attempt to partner with the CBC in 2011 to bid for coverage, CBC reached a deal of its own in August 2012, winning the rights to the 2014 and 2016 Games. On February 7, 2013, CBC announced that it had reached deals with Sportsnet and TSN for both networks to become their official cable partners, beginning at the 2014 Winter Olympics. CBC will continue this sub-licensing agreement through the 2020 Summer Olympics. Sportsnet televised coverage of the 2015 Pan-American Games, also as part of a sub-license with CBC; it aired coverage of the soccer tournaments, as well as a Men's basketball semi-final game involving Canada. Sportsnet Central – The daily sports news/highlights program of Sportsnet. Hosted by various personalities. Formerly known as Sportscentral, Sportsnetnews, and Sportsnet Connected. Hockey Central – News and reports from the NHL. Hosted by Jeff Marek, and features hockey analysts Nick Kypreos, Bill Watters and Gord Stellick. Hockey Central at Noon – Simulcast from CJCL; News and reports from the NHL. Hosted by Marek and features either Nick Kypreos or Bill Berg as co-host. Premier League Matchday – News and reports from the Canadian and world soccer scene and highlights from matches from all the major leagues in Europe and around the world with Gerry Dobson and Craig Forrest. Tim & Sid - sports talk program hosted by Tim Micallef and Sid Seixeiro. This list includes the all time Sportsnet 360 staff dated to its days as The Score. Sportsnet operates a TV Everywhere service known as Sportsnet Now, which streams the programming of the Sportsnet regional channels, Sportsnet One, and Sportsnet 360. On March 31, 2016, Rogers announced that Sportsnet Now would be made available without a television subscription as a subscription-based over-the-top streaming service, initially priced at $24.99 per-month. The service remains available at no additional charge to subscribers to Sportsnet on participating providers. In October 2018, the price was dropped to $19.99, annual subscription options were added and an additional tier known as Sportsnet Now+ was introduced, adding additional international soccer and rugby events, and out-of-market streaming of regional NHL games for Canadian teams whose rights are owned by Sportsnet. Sportsnet operates four high-definition feeds, one for each regional channel. Originally, Sportsnet operated one national feed that consisted primarily of a simulcast of Sportsnet Ontario, carrying nationally televised events, or separate content from other regional feeds. That feed was launched on September 1, 2003. In 2007, Sportsnet began using a second high-definition feed in order to broadcast selected regional NHL games in HD, beginning in the 2007–08 NHL season, activated only in the regions where a game is set to be televised. On January 26, 2009, the national HD feed was replaced by individual HD feeds for each region. On October 5, 2015, Rogers announced that it planned to produce 101 sports telecasts in 4K ultra-high-definition format in 2016, including all Toronto Blue Jays home games, and "marquee" NHL games beginning in January 2016. These broadcasts are offered via 4K event channels on participating television providers. On January 14, 2016, in cooperation with BT Sport, Sportsnet broadcast the first ever NBA game produced in 4K, and the first live sporting event in 4K in Canadian history—a Toronto Raptors/Orlando Magic game at O2 Arena in London. Sportsnet's first domestic 4K telecast, a Toronto Maple Leafs/Montreal Canadiens game, aired January 23, 2016. ^ a b c "Rogers Communications Buys Remainder from Sportsnet". December 30, 2004. Retrieved January 2, 2017. ^ "Rogers Media sole owner of Sportsnet". Broadcaster Magazine. December 31, 2004. Archived from the original on January 3, 2017. Retrieved January 2, 2017. ^ "CRTC Decision 97-290". Canadian Radio-television and Telecommunications Commission. July 3, 1997. Retrieved December 24, 2009. ^ "Decision CRTC 96-601". CRTC. Retrieved December 3, 2014. ^ a b c "From inspiration to perspiration". Sportsnet.ca. Rogers Media. Archived from the original on October 17, 2008. Retrieved May 7, 2011. ^ Chris Zelkovich, "Sportsnet adds another channel to its roster", Toronto Star, July 28, 2010; retrieved July 29, 2010. ^ Dowbiggin (January 12, 2011). "Change is the operative word in sports radio". Globe and Mail. Canada. Retrieved January 13, 2011. ^ Krashinsky, Susan. "Rogers builds Sportsnet brand with soccer station". Globe and Mail. Canada. Retrieved July 27, 2011. ^ "Sportsnet Magazine launches with NHL preview". Sportsnet.ca. Archived from the original on September 29, 2011. Retrieved September 30, 2011. ^ "Sportsnet unveils new brand: Fuelled By Fans". CityNews. Retrieved August 26, 2015. ^ Krashinsky, Susan (September 29, 2011). "Sportsnet drops the 'Rogers' and gains a whole new look". Globe and Mail. Canada. ^ "Rogers wants CRTC to ease Score licence rules". Toronto: The Globe and Mail. January 16, 2013. Retrieved January 17, 2013. ^ "CRTC clears way for Rogers to buy Score". Toronto: The Globe and Mail. April 30, 2013. Retrieved May 1, 2013. ^ "CRTC Gives Final Approval to Rogers' Acquisition of Score Media". Broadcaster Magazine. Archived from the original on December 3, 2013. Retrieved May 1, 2013. ^ "Rogers rebrands The Score as Sportsnet 360". Marketing Magazine. Retrieved June 5, 2013. ^ "Sportsnet president Scott Moore resigns from Rogers". The Globe and Mail. Retrieved October 3, 2018. ^ "Canada's Sportsnet and TSN to Share English Premier League Rights". The Hollywood Reporter. Retrieved December 29, 2014. ^ "TSN, RDS announce new media rights agreement for Champions League, Europa League". TSN.ca. Retrieved December 22, 2014. ^ "Watch Germany's Bundesliga on Sportsnet". Sportsnet.ca. Rogers Media. Retrieved July 31, 2015. ^ "Sportsnet, TSN and CTV to cover World Cup together". Cartt.ca. Retrieved December 29, 2014. ^ "CBC, Sportsnet deal broadens FIFA coverage". CBC Sports. Retrieved December 29, 2014. ^ Sportsnet Signs New Deal For Rogers Cup Until 2015 Archived June 7, 2015, at the Wayback Machine, sportsnet.ca; accessed February 23, 2015. ^ "Rogers extends sponsorship of Rogers Cup". Sportsnet.ca. Retrieved May 19, 2015. ^ "TSN takes over from Sportsnet for ATP Tour 1000 and 500 tennis coverage". Eh Game. Yahoo! Sports. Retrieved February 9, 2016. ^ "What the Sportsnet announcement means for curling; Charette, Albrecht both deserving of praise". Calgary Herald. August 30, 2012. Retrieved October 17, 2017. ^ "Grand Slam of Curling returns to CBC". CBC Sports. August 30, 2012. Retrieved August 31, 2012. ^ "Blanketing Canada with in-depth series coverage". IndyCar.com. Archived from the original on March 2, 2013. Retrieved March 4, 2013. ^ "Last-minute deal gets IndyCar race coverage for Canadian fans". Toronto Star. Retrieved March 13, 2019. ^ "IndyCar reveals international TV broadcast deal". Motorsport.com. Retrieved March 6, 2019. ^ a b c Faguy, Steve (August 18, 2014). "NHL broadcast schedule 2014-15: Who owns rights to what games". Fagstein. Retrieved August 23, 2014. ^ "TSN, TSN Radio 1200 become Senators' broadcasters". TSN.ca. Archived from the original on February 1, 2014. Retrieved January 29, 2014. ^ "Canadiens, Sportsnet ink new regional deal". Sportsnet.ca. Retrieved September 2, 2014. ^ "Tomorrow's Stars Today: Fans To Get More Games, More Coverage This CHL Season on Sportsnet". Sportsnet.ca. Retrieved November 15, 2014. ^ "NHL deal with Rogers a huge blow to TSN and CBC". Toronto Star. November 26, 2013. Retrieved November 26, 2013. ^ Krashinsky, Susan (September 9, 2011). "Bell Media, CBC partner for Olympic bid". Globe and Mail. Canada. Archived from the original on September 9, 2011. Retrieved September 9, 2011. ^ "CBC wins rights to 2014, 2016 Olympic Games". CBC Sports. Retrieved August 1, 2012. ^ "Sportsnet to air 200 hours of Sochi Games". Sportsnet.ca. Archived from the original on February 13, 2013. Retrieved February 8, 2013. ^ "CBC/Radio Canada welcomes partners in 2014 Sochi Olympics coverage". CBC. Retrieved February 8, 2013. ^ "Russell: CBC's Olympic deal a big win for Canadian sport". CBC Sports. Retrieved October 29, 2014. ^ Shoalts, David (October 28, 2014). "CBC lands broadcast rights to 2018, 2020 Olympics". The Globe and Mail. Retrieved October 29, 2014. ^ "The Great Canadian Ratings Report: Pan Am coverage unsatisfying, but drawing big audiences". Yahoo! Sports. Retrieved August 19, 2015. ^ "Tim Micallef, Sid Seixeiro ready to write their latest chapter". Toronto Star. Retrieved July 7, 2015. ^ "Rogers to offer all Sportsnet content in streaming service". CBC News. Retrieved April 1, 2016. ^ "Rogers lowers cost of Sportsnet Now and launches Now+ with more content". MobileSyrup. October 11, 2018. Retrieved March 13, 2019. ^ Rogers Sportsnet Continues as Home of Canucks Hockey with 47 Games in 2007–08 Archived January 10, 2008, at the Wayback Machine Retrieved on May 25, 2007. ^ "Rogers leveraging sports ownership to push 4K TV". The Globe and Mail. Retrieved October 6, 2015. ^ "4K content becomes a reality in Canada". Toronto Star. Retrieved January 21, 2016. ^ "4K Sports Descend on Canada: First-Ever Live 4K NBA Game From London Kicks Off Parade of 4K Content". Sports Video Group. Retrieved January 16, 2016. ^ "Sportsnet to produce first NHL game in 4K". Sportsnet.ca. Rogers Media. Retrieved January 24, 2016. "TSN2 adds Sunday Night Baseball to its lineup". TSN.ca. Archived from the original on June 29, 2011. Retrieved May 23, 2010.